It seems like I can just copy and paste the same posts because the same things happen over and over again. Tugboat man withdrawals. Cold turkey. I took him to the airport at 4:30 a.m.
Once again there’s that lonely ride home. This time he’ll probably be gone for six weeks or so. Hopefully, but that’s what was supposed to happen last time, and it turned into FOUR months! I pointed my camera straight up because the sky was so blue, more blue than I’ve seen in a long time. Not a cloud in the sky. And so hot. Record-breaking hot. Drinking ice water all day. And nope, I can’t go with him, in case you were gonna ask. 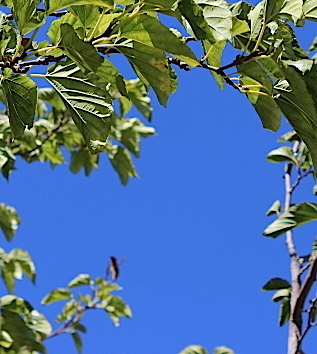 Sky blue, SO BLUE — can you believe this is an un-retouched pic I snapped in our backyard? Kind of heart shaped, can you see it? If you tilt your head just a teensy bit to the left, can you see it now? This entry was posted in All Posts, My Enchanted Life, Photography and tagged "Blue Skies", Absentee Husband, marriage, merchant mariner, my husband is a tugboat captain, professional mariner, Relationships, shopping, Tugboat, Tugboat Captain, Wife of a traveling husband, Willie Nelson by Enchanted Seashells by Princess Rosebud. Bookmark the permalink. I can understand being blue. Lately it seems that your tugboat man just gets home and he is gone again. Love the picture and the sky is really a beautiful blue.Yes, can see the heart also. It’s just not fair!!! (That’s me whining.) Like I was telling a friend yesterday, it wouldn’t be so bad if I didn’t LIKE my hub and like to spend time with him-we actually do really good being together 24 hours a day, we don’t really get annoyed with each other, but that’s a good thing, right? Yes, it’s a good thing that you enjoy being together. We also get annoyed with one another at times but love being together and wouldn’t change it for the world!!! A good thought to remember, thank you! I can’t believe how hot it is here today, almost too hot to go outside. What’s your weather like? That’s the tough thing about being married to a mariner. When I was shipping out I was single and had no boyfriend. I completely understand why so many marriages don’t make it. I completely know how lucky I am to have a mariner husband who is not gone for more than a week at a time in his current job. When we met, we both shipped out for six months (plus time to get a relief out to us, and that could be another several weeks) and one month home. I am finding that when my husband is gone, I’m so busy and fulfilled, that the thought of him being home every single day when he retires, scares me. We met while working at the same company; he was master capt of all the vessels and I was in marketing at a local cruise company so we knew we could spend a lot of time together. It’s not always perfect; I can get on anyone’s nerves haha, but then he goes surfing or to his man cave or I go shopping and we do have our alone time. It is different when he’s gone, I have all my own things to do, and they do take a back seat when he’s home, but with my next project (the secret one) I’ll be so busy there won’t be time for anything else! We got back from vacation more tired than when we left. And I feel creatively flat NOT good. Actually, I feel like a deflated balloon. I bet that’s how you feel too. I’m waiting for the upsurge. Blue skys and a blue heart are so disparate. I feel for you, dear.